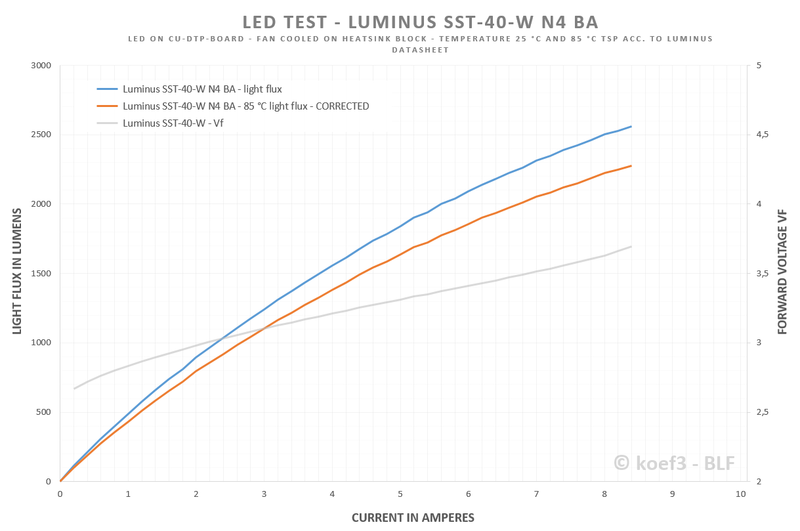 LED test / review – Luminus SST-40-W Specialty White N4 BA (+ dedomed) – Here it is, the next gen XM-L2! This is the english version of my first test (August 2017). Because of more accurate results and some minor changes in the text the german version is no longer valid anymore! I bought this emitter at Kaidomain several months ago. Caution: datasheet is still in preliminary state (March 2018)! The SST-40-W is very similar to the well known XM-L2. The sharply demarcated die sitting on a silver grey ceramic base. 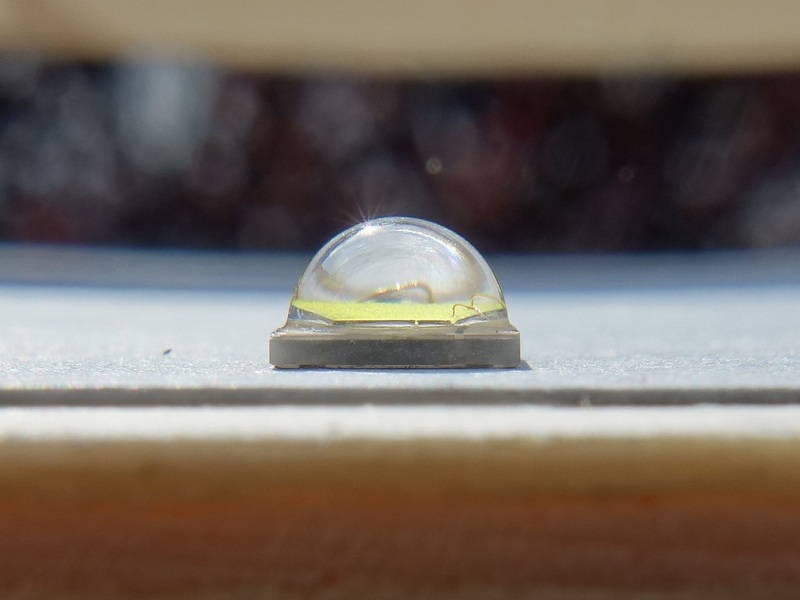 A silicon dome covers the LES which enlarges it’s surface significantly and increases also the total light flux. The emitter is 4.95 x 4.95 mm (0.195 x 0.195 in) in size and equals to the XM format (also known as 5050). Thanks to the symmetric package the use of lathe spun center rings is possible. Moreover, because of the standard footprint the whole range of already available accessoires for XM / 5050 can be used. The LES is sharply demarcated, like the other well known Cree emitters (XP-L, XM-L/2). There are no discolored areas around the die so the beam pattern and color over angle should be very high. The LED chip is built in classic lateral design, which is uncommon for actual LED technology and products. The most of new released emitters are designed in Flip Chip or CSP technology which improves the thermal characteristics and more efficient use of the LES. Typical for lateral LEDs are small areas for bonding contacts which cannot emit any light. The LES equals with dome 8.02 mm² (0.0124 sq in). 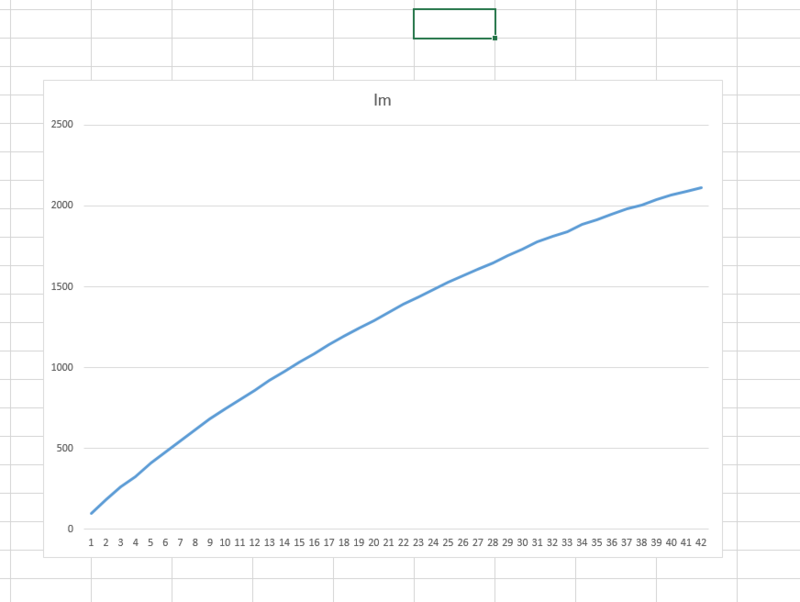 Without dome the LES is smaller by almost exactly the half, but 3.99 mm² (0.00618 sq in). Hint: I powered the LED only to max 8,400 mA not to destroy the emitter. The limiting factor of this emitter are the bonding wires which burnt at 9,400 mA. In the diagram it can be clearly seen in Vf curve that of about 7,500 mA the voltage increases significantly which is a clearly sign that the wires are reaching their maximum load limit. I cannot recommend a current of more than 7,400 mA because of shorter expected lifespan of the bonding wires. Till 4,500 mA the output of the SST-40-W is nearly the same of a XP-L HD V5. Over 5,000 mA it is brighter because of the better heat dissipation in bigger package and reaches also a higher maximum. 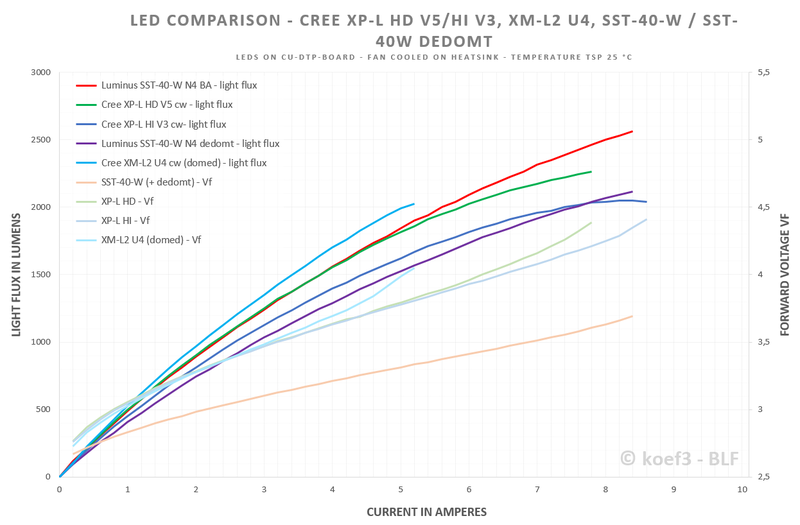 At 7,800 mA the XP-L died (burnt wires) at 2,264 lm and 4.39 V.
In dedomed state the SST-40-W is less efficient than a XP-L HI V3. In general there is the same behavior as against the XP-L HD: above 5 to 6 Amps higher maximum possible and therefore a higher flux at highest currents. A replacement of XP-L HI V3 not really worth it unless the lower Vf is superficial, like for better regulation or better total efficiency. The XM-L2 tested here is very efficient, due to its reached highest flux bin U4. It is also more efficient than XP-L and SST-40-W. But also the Vf is very high, especially at the highest possible power, and ist bond wires blown at 5,200 mA. The old XP-L HD V5 features a higher flux as the XP-L2! Basically it has only a lower Vf and therefore a higher efficiency, due to a not fulfilled flux bin (see test of XP-L2 here). 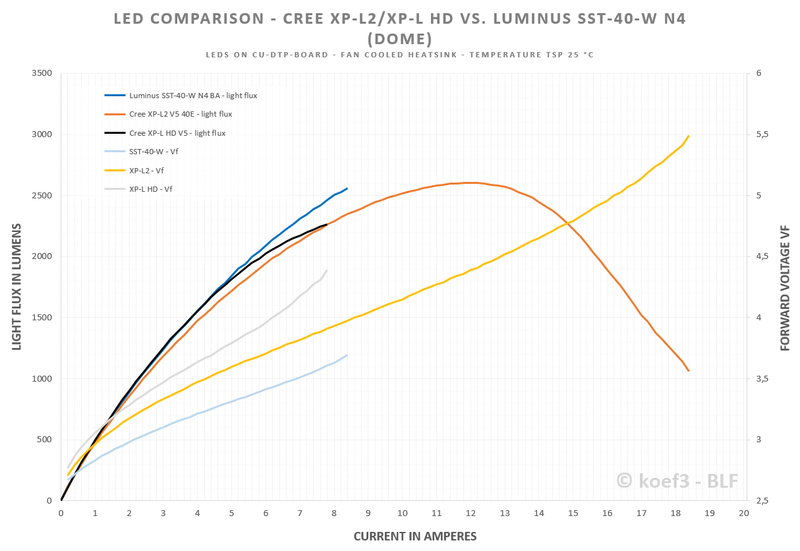 The comparison of SST-40-W and XP-L2 is also interesting. It is important to know that the XP-L2 shown here does not fulfill its claimed V5 bin so that these statements are not mandatory for other batches of this type! Against the new generation XP-L2 the SST-40-W features the higher efficiency, the lower voltage and – if the wires wouldn’t burnt – a higher maximum light flux at almost same current. Moreover, the SST-40-W achieves a better beam pattern and more homogeneous colors in corona and spill, not like XP-L2 or XP-G3. In general, the SST-40-W performs in almost all disciplines better than the XP-L2. The only real drawback could be the earlier death at 9.4 Amps but considering that the maximum of the XP-L2 is around 11.5 Amps and the light flux increases only at approx 160 lumens this problem is in real world applications negligible. 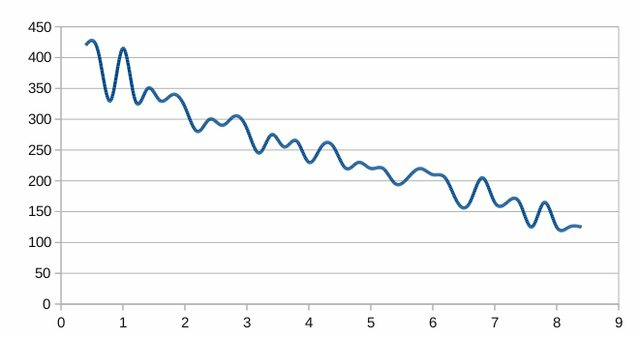 At low Tj (10 °C and below) the light flux decreases surprisingly instead of rising, like at most other LEDs at these temperatures. I've been able to reproduce this behavior several times. Also the Vf rises significantly higher at low temperatures than stated in the official datasheet. The dedoming is not as easy as we know from earlier lateral LEDs like XM-L2 or XP-G2. With chemical dedoming the dome breaks into smaller pieces, but some parts remains still on the LES and ceramic base. Maybe the results can be optimized by changing the time of exposure, but I haven’t tested this yet. Hot dedoming can work, but unfortunately in not all cases. The risk to damage the phosphor on the LES is still there. In general the phosphor layer of the SST-40-W is more crumbly and sensitive against mechanical treats than of earlier LEDs (XM-L2). Important hint: Absolutely avoid touching the LES after dedoming, there’s a high risk of damaging the phosphor layer! To stay on the safe side, I recommend the shaving method in which the dome is sliced over the LES to increase also the luminance. Hint: I powered the sample used for luminance measurement only up to 8,400 mA not to destroy the LED so the values at Absolute max current are a little bit higher! In case of improving the range / brightness compared with XP-L HI V2 / V3, the gain in throw is negligible. For sure, the luminance is a little bit higher as of the XP-L HI V3 because the SST-40-W profits from the bigger footprint, but I would not recommend to drive the SST-40-W at such a high current to ensure a higher lifetime (bonding wires). Because of all my tested XM-L2 samples died at only 5.6 Amps I cannot provide any luminance measurements of it. Despite that the SST-40-W is way better than the XM-L2 because of higher flux in dedomed state, much lower Vf and – depending on prevously used LED – higher efficiency. Thanks to the classic lateral design the beam pattern and color behavior corresponds to the XM-L2 and (in some points) XP-L. There are no other colored areas around the spot or corona, neither in use of reflectors nor TIR optics / lenses. Because of this I will not post any beamshots of SST-40-W in optics, because they are already known of (modded or original) flashlights also in this forum. The both small non-lit areas of bonding pads does not affect the beam pattern at all. The tint is a cold and bit blueish white, at approx 7500 to 8000 K CCT. The color rendition is low which is normal for cool white light sources in this color (rendering) class. 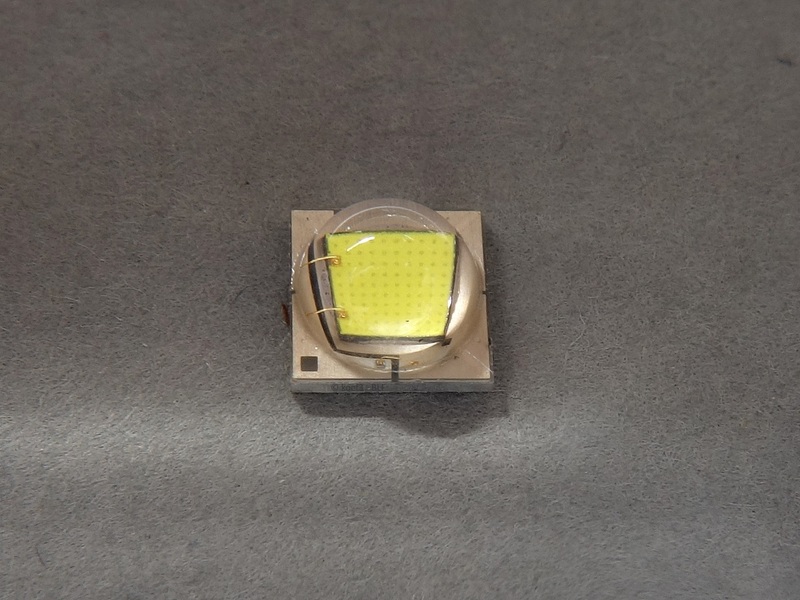 Unfortunately this LED is only available in low CRI and only in cool white although in the (preliminary) datasheet are stated also warmer tints (low to 4500 K CCT) which aren't available still today. Here we go – the next gen XM-L2! That’s basically everything you know about this LED. The efficiacy is very high, it can be overpowered very well. Also the Vf is reasonably low, even lower as of the XP-L2. Luminus delivers a very nice and state-of-the-art LED which is in almost every thing better as the actual Cree emitter generation and the (inofficial) predecessor XM-L2. Only drawback are the burnt bonding wires at 9.4 Amperes which limits the maximum possible flux in a very hard way. I did not like the difficult dedoming, I can only recommend the shaving method for this. For lights and applications with XM footprint or still equipped with older XM-L2 especially in lower bins this LED might be the (almost) perfect upgrade, also the beam quality is really high, also known from earlier LEDs. In short summary as I mentioned at the beginnging: here we go – the next gen XM-L2! 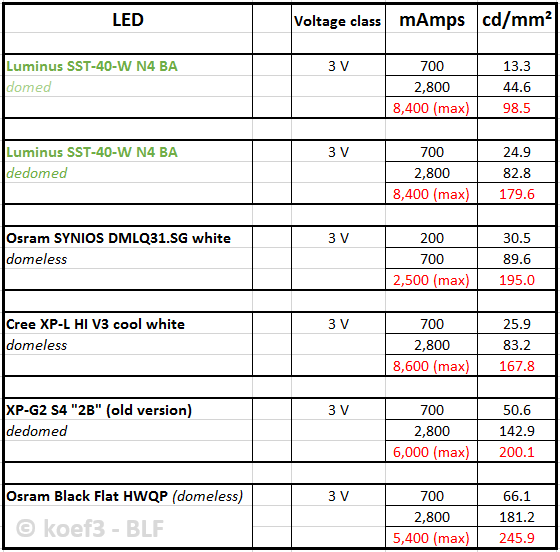 Addendum: I think it is not really professional for such a LED manufacturer like Luminus to publish a datasheet still claimed as ‚preliminary‘ (in which crucial subjects still could change without any further notice!) 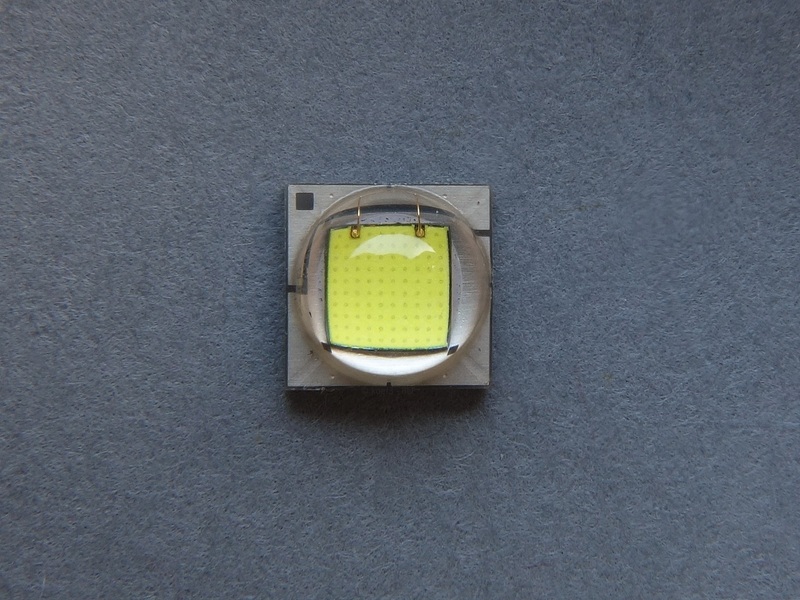 although this LED is already in mass production and has been delivered to suppliers and companies. Also it might not the best way for change the subjects and important maximum (electrical / behavior) characteristics of the datasheet AFTER the LED was released for general sale. In an earlier version of the datasheet the maximum forward current was stated with 3,000 mA, not 5,000 mA like now. Very nice review. Thank you! What kind of tint shift did you get after dedoming? What kind of tint shift did you get after dedoming? Warmer (approx 5000 - 5500 K CCT) tint with a bit green in it. But much less than of Cree LEDs (XP-G2 / XM-L2), so it should be okay. Better color tint you might get if you slice the dome. Thanks for the test. With the low Vf and high luminance dedomed this LED is the optimal one (IMO) for single cell triple emitter applications. The emitters are driven very well without the risk of blowing the bond wires. With an aspire 4300mAh 26650 my convoy L2 triple SST40 pulls 19A. I built a triple that pulls just over 24A with these (multiple cells in parallel though). It’s a fun light but I’m not very fond of the tint. At that brightness you could could use a filter and it would still be very bright. I achieved 160 kcd in an Emisar D1S with dedomed SST40. Nothing else changed just the led. Can anyone suggest a good 17mm to 22mm 1s-2s buck drivers to run this LED up to 7-8A, or so? how did you dedomed SST40? It was an early led that somebbody told here on blf it was easier to dedome. I putted it in regular 95 octane petrol floating on wires upside down. And the dome falallen off. 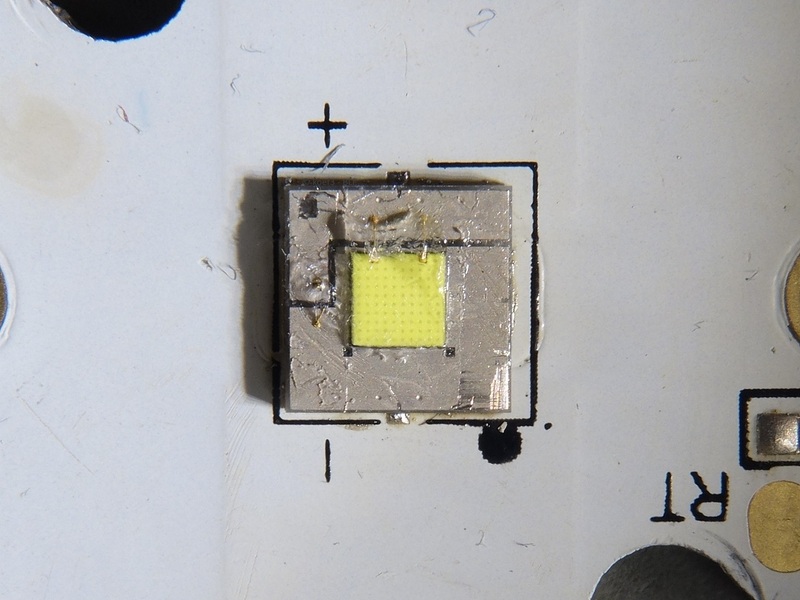 It leleft a little on the phosphor but I removed it with an Xacto knife under microscope. how long did u leave it in 95 octane petrol ? 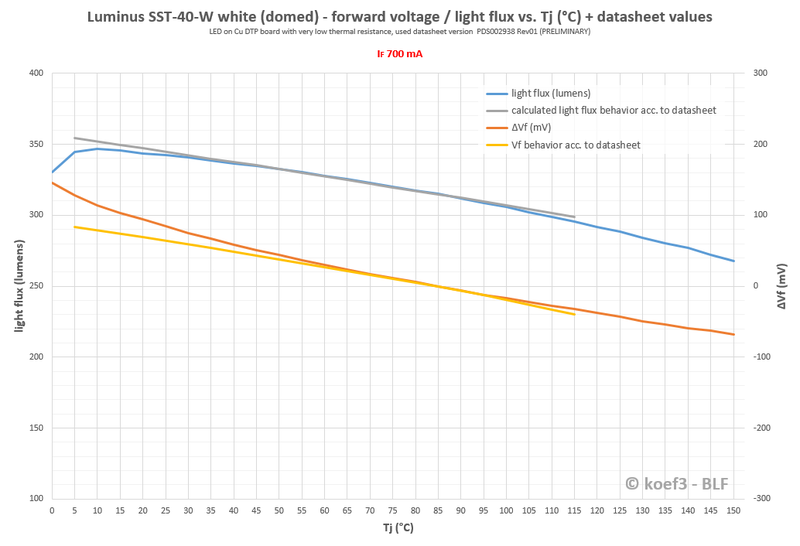 I updated the luminance values for all LEDs shown in test chart, including SST-40-W also in dedomed state. To ensure more realistic values for 'real-life' conditions (flashlight use / secondary optics) I established a new testing method to determine the luminance with a SMO reflector, but same heatsink / test setup. All upcoming and already existing tests will use this method! Very interesting results at changing Tj. The setup used here is the same as earlier light flux vs. Tj tests. I have a question, a bug might have slipped into raw data. Dedomed output rises from 0.8A to 1A by 25.4%. I have a question, a bug might have slipped into raw data. Dedomed output rises from 0.8A to 1A by 25.4%. Here’s Δlm/ΔA vs. A chart. A bit noisy in general, but the dimple at 0.8A really stands out. Though as I look at it now, it does so partially because both 0.6A and 1A are a bit low.